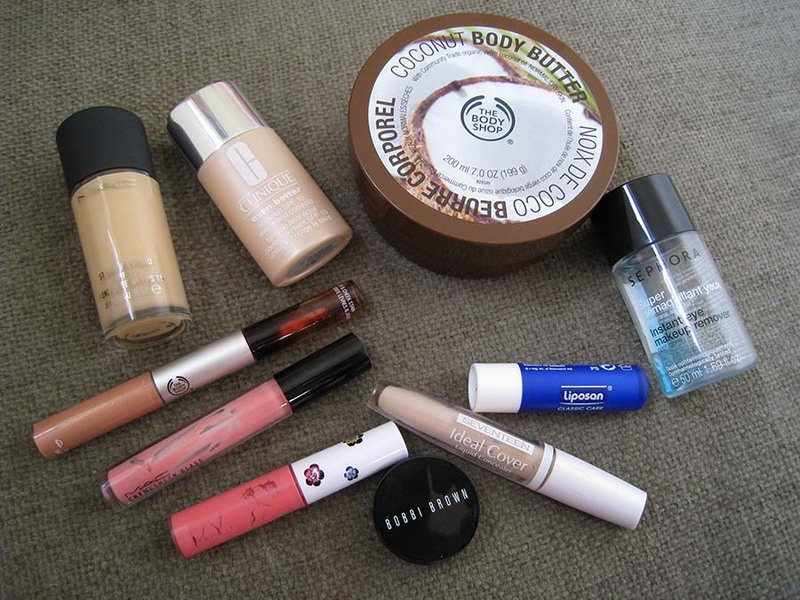 I really wanted to start doing empties posts and since I gathered few of them lately, I decide to do my first post. I think it's a great idea posting all your empties every month or every two months because you have a complete opinion about a product and that way I can let you know whether I liked it or not and whether I'll repurchase it or not. Not all of these products are November empties, some of them are empties from the past two months, but I wanted to include them now since it's my first post. It's hard for me to gather empties because most of the times I don't use up products, especially face products because I tend to break out easily so I can't use them, but I'll try to keep up with these posts every month or every two months! Years ago this foundation used to be my HG foundation, I actually purchased it twice, but after trying the Pro Longwear I realised how bad it was. It was way too yellow, and too cakey, also it was hard to blend it on my skin, and after two hours it transfered around my nose and mouth. I definetely won't repurchase it again. When I first got this foundation I hated it I don't know why, so I kept in my make up drawer for a long time. But last spring I decided to give it a second chance and I realised how wrong I was. It covers really well, makes my face look seriously flawless, even my mother complimented my face and she never notices any difference on the foundations I use. Also the shade is the perfect beige, I prefer beige shades over yellow ones. 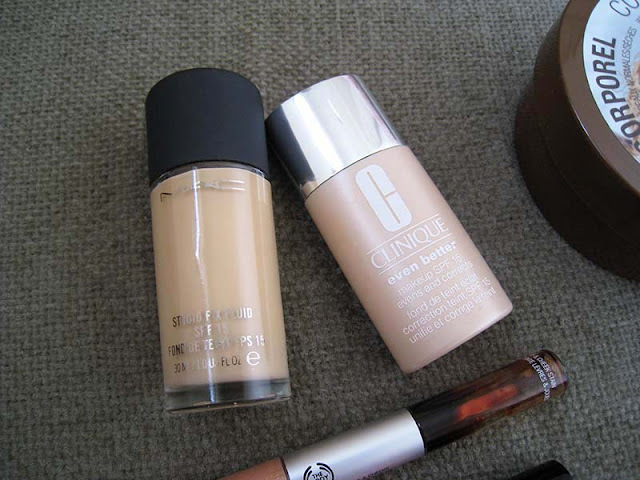 This one and Mac's Pro Longwear are my two HG liquid foundations. I've already purchase a new one, because this one was too old to use anymore. I can't even remember when I got this lip and cheek duo from The Body Shop, but I remember it was from a limited edition summer collection. I really liked the cheek stain, I was using it under my powder blushes to make them last longer and it was working, the lipgloss was way too sticky for me, but the shade is a pretty golden beige. 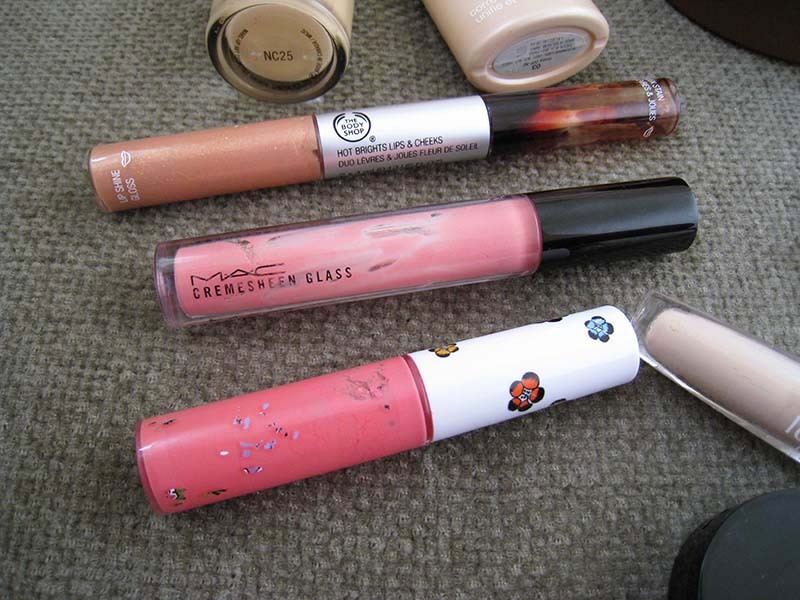 This is actually one of the few Mac lipglosses that I actually finished up, because most of them go bad really quick, within a year or so, but this one never did, same thing with the Dazzleglasses. In my opinion the Cremesheen Glasses are the best glosses that Mac has, very smooth, non sticky at all and very glossy without shimmers, my perfect gloss! I'll propably repurchase it in another shade, this one was too sheer. So this one I had to toss it out because it started taste really bad. Every single lipglass I purchased from Mac gone bad, all of them really quick, but this one lasted me a little over two years. I have to say that I really loved this shade, and I liked the fact that it didn't have shimmers. But since it was limited edition I can't repurchase it. A good dupe though it's Pink Lemonade also from Mac. I used to love this product, I've actually purchased it three times until now. 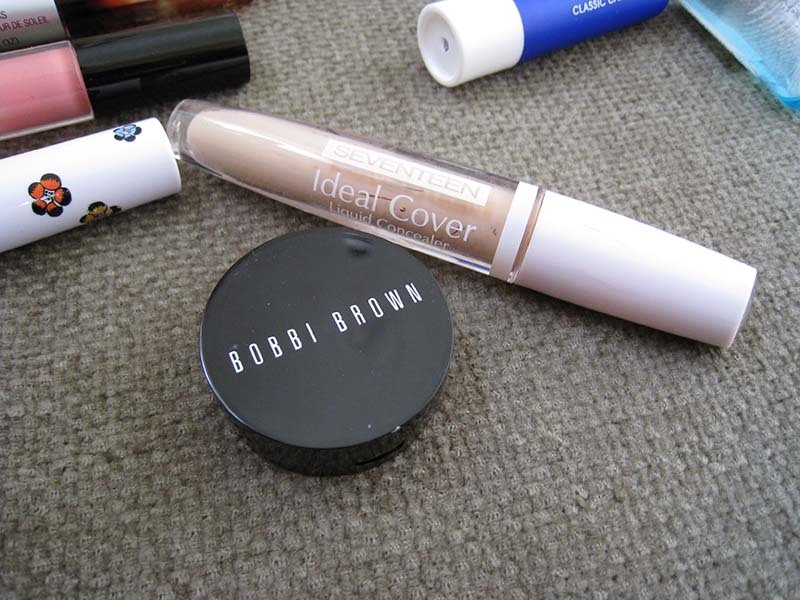 I was using it alone as a concealer, it has the perfect peachy shade for my dark brown undereye circles. I decided to stop using it, after I realised how bad it creases within a few hours. One more con is that it's very expensive, it costs over 25 euros, and for a product that lasted me only a few months I think that it's way too much. I don't think I will repurchase it again. I've mentioned this concealer too many times already, I absolutely love it! It's very lightweight with medium coverage, it never creases, and it costs only 12 euros. I will definetely repurchase it, I actually did a month ago. This is my favorite summer body butter, I've repurchased it many times in the past, it has the perfect coconut scent, and a tube of it it lasts me for many months! 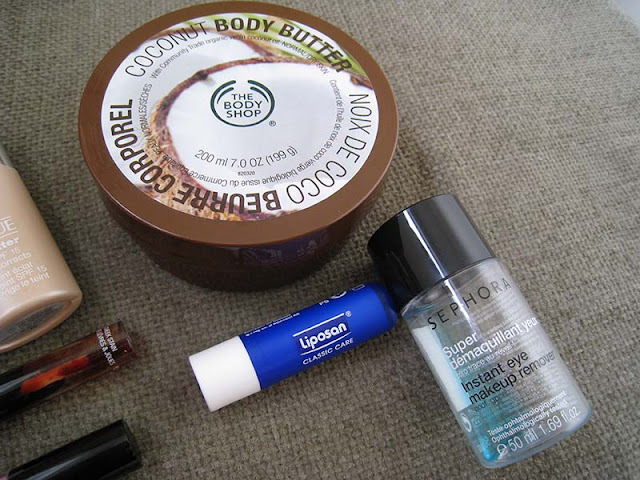 I actually finished it three days ago, and I think it was about time because now I want to use body lotions with warmer scents such as the Shea Body Butter and Vanilla Body Lotion also from The Body Shop. OK this eye make remover is so bad I can't even tell! It barely removes any mascara, it burns a little and it seriously stinks! I purchased it in a mini size a year ago when I was first trying some of Sephora's skincare products. It's a totally different product from my HG eye make remover also from Sephora, the Waterproof Eye MakeUp Remover which contains oil, and it removes my eye makeup quickly without any effort. This lipbalm is the only one that I blindly repurchase every single time, I can't live without it. Some people hate it, propably because it's very creamy, but I suffer from dry lips at winter and summer, and it's the only one that helps my lips feel comfortable and not bleed. Have you try any of these products? Did you like them? Let me know! Πολύ ωραίο και κατατοπιστικό το post σου. Θέλω να σε ρωτήσω για το Seventeen Ideal Cover Liquid Concealer έχω μαύρους κύκλους, όχι πολύ έντονους αλλά έχω , θα μου πρότεινες να το δοκιμάσω? Nai, edw pou exw entonous kuklous k kanei kali douleia, genikotera an k exw kuklous den mou aresoun panta ta super kaluptika concealer k auto einai oti prepei. Σου κάνει δουλειά το Λιποζάν? Εγώ που έχω επίσης ευαίσθητα χείλη, δεν μου κάνει τίποτα, και φεύγει αμέσως. Φαντάσου, δεν έχω καταφέρει ΠΟΤΕ να τελειώσω λιποζαν!!!! Nai, na fantasteis to xrisimopoiw anellipws ta telutaia 2 xronia, k teleiwnw ena kathe 3 me 4 mines. Exw dokimasei kamposa k farmakeutika alla den mporoun na to xeperasoun, gia mena toulaxiston. Πολυ καλο ποστ! Μου αρεσει να διαβαζω για τα "empties"!! εχω αρχισει να πιστευω οτι τα bobbi brown corrector και concealer λειτουργουν τελεια μονο μεταξυ τους.ετσι τα ειχα δοκιμασει στο attica και πειστηκα να παρω το corrector αλλα απο την αλλη 29e το corrector και 30φευγα για το κονσιλερ με την πουδρα εεε νομιζω οτι ειναι παααρα πολλα at this point! Hehehe nai, alla mou thumizei kalokairi k me lupei, tha vazw vanilla body lotion twra! Eksairetiko to post sou Sophia mou!! !Sumfwnw apoluta gia to Studio Fix kathws kai gia to even Better (phra deigmataki kai mou arese para para poly).Filakia polla polla!!! to make up apo mac mou kinise trela yo endiaferon,parolou pou molis xthes agorasa ena apo essence! beauty addict eimai pos n to kano?? !! fainetai ontos mpez se apoxrosi poli fisiki kati pou me exei katenthousiasei kathos oles tis fores to xroma apo mac founfdation pou exo parei einai athlio k klaio ta euro mou!!! tha to koitaxo! εμενα το κονσιλερ της bobbi Brown και μονο του ειναι το μονο που μου φωτιζει τους απαισιους μαυρους μου κυκλους χωρις να τους κανει γκρι.το corrector το ειχα πριν 2 χρονια και θα το ξαναπαρω με την επομενη εκπτωση γιατι μου αρεσει πολυ ο συνδιασμος τους.μηπως φορας καποια πιο ενυδατικη κρεμα ματιων και σου φαινεται λιπαρο? το body butter THS με καρυδα το εχω αγορασει-κ τελειωσει - 4 φορες μονο αυτο σου λεω!! το λατρευω ολο το καλοκαιρι με αυτο τη βγαζω..
Πολυ ωραιο το blog σου.Αν θελεις ριξε μια ματια και στο δικο μου blog http://zoydaki1985.blogspot.gr/θα χαρω πολυ να γινεις μελος του. You finished a lip gloss? Wow, you are my hero! !